The City of Ottawa is doing everything it can to get OC Transpo riders on board with the new smart card technology, which is set to launch later this summer, according to OttawaStart. 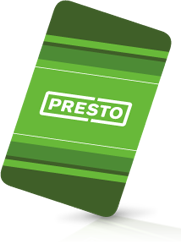 OC Transpo has inked a deal with PRESTO to distribute the first 200,000 smart cards for free to its customer starting June 10. The City’s cost of providing this service is $250,000. “Transit users will be able to go online to purchase, renew, or load up their cards, reducing the need to wait in lineups every month to purchase a new transit pass or buy tickets,” said Mayor Jim Watson. The free cards will be available online and at select City facilities. PRESTO cards will be operation on most OC Transpo buses and on the O-Train starting July 1, 2012.